If you're in Slytherin house, you had better have a lot of pride (not to mention a bit of a thick skin). Sure, the wizarding world may mischaracterize your house based on a few bad eggs (OK, one really bad egg in particular), but there is a lot to love about wearing the green and silver! Severus Snape is one of your own, your common room is a cool lair beneath the Hogwart's Great Lake, and creepy or not, being able to speak Parseltongue would be downright cool. 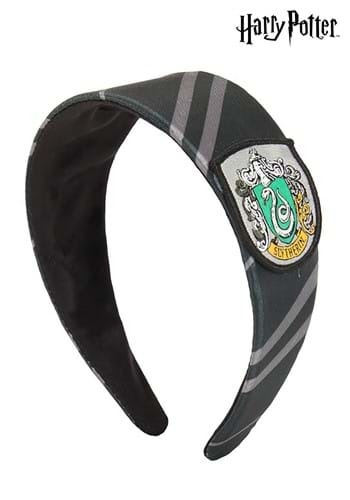 So rejoice, little lady, and slip this Harry Potter Slytherin Headband atop your locks. Wear it over your school uniform to keep your hair out of your face during potions lessons, and you'll find yourself growing prouder by the day to be a part of this house's long and (mostly) lustrious legacy! This licensed hair accessory features diagonal stripes in Slytherin's house colors: green and silver! It also has the house crest added to one side, so everyone will know where you've been sorted! Of course, there are some Slytherin aspects you may want to play down if you hope to garner favor from the other wizards: like Salazar Slytherin using a giant snake to weed out Muggle-born students, for example. We'd leave that part out. Focus instead on how Regulus Black left the Death Eaters to try to destroy one of Voldemort's horcruxes! That's much better party chatter.